Friday's cover story in the Silicon Valley Business Journal was all about the custom home building craze that has struck the Bay Area. Nathan Denato-Weinstein's article, "Build it just so: rush on custom homes, the latest sign of a boiling hot real estate market," is a fun read about the construction boom being fueled by tech employees who are increasingly building rather than buying new homes. Thomas and I were included in the article as a "couple that exemplifies the tech trend" (though I'm more of an example of a tech dropout #leaningout). Most of the article is behind a paywall, so you'll either need to subscribe online or pick up a copy at a local bookstore this weekend to read the multi-page spread. The issue also includes ranked lists of the top residential builders, contractors and real estate firms in Silicon Valley, so it's very helpful resource if you're looking for the "best of the best" to help you with your real estate and construction needs. 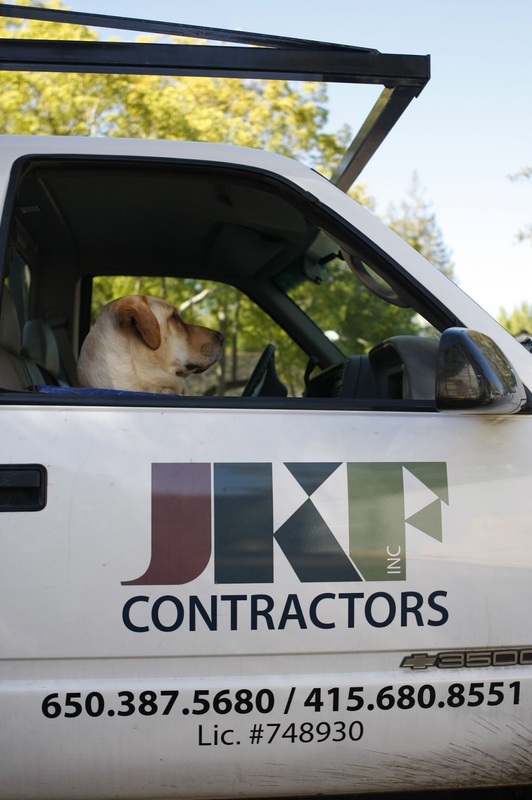 I was really glad to see them feature our general contractor, Jeff Frankenfield, in the article because in my book he is the world's best contractor. The Business Journal list ranks the top 25 Bay Area contractors by annual revenue (#1 had 18M in revenue last year, #25 had 1.2M). Jeff didn't make it onto their list, but we consider that a good thing. As Thomas, (my numbers guy) puts it, "I care more about revenue from our job as a percentage of his annual revenue." In other words, we wanted to be our contractor's #1 source of revenue, ergo his top priority and not just one of the dozen houses he would churn out this year. Below I've outlined just a few of the many qualities we appreciated about Jeff. If you can't hire him maybe this list will help give you ideas of what to look for. When I first hired Jeff to remodel my house in Mountain View, I was working 12 hour days at a little startup called LinkedIn and didn't have much time or energy to devote to the process. Jeff took care of everything, involving me only when absolutely necessary. He emailed me my task lists and deadlines and made the process as effortless as possible. The new addition literally just unfolded over six months without me having to think about window trim thickness, lightbulbs, cabinet hardware and which direction to run the flooring. This time around our house in Palo Alto has been my full-time gig and I've wanted to learn as much as possible. Jeff involves me in every last decision from how the stucco wraps around the garage jam to how tall the stair treads will be. He's been a great teacher and goes out of his way to explain things I would never even notice. We did not approach our Palo Alto home build with an open check book--the house is an investment that we expect a solid return on. We were prepared to spend the money to make it a high quality home with select luxury touches but we wanted to be smart about where to spend extra money and where to save. Jeff recommended good value investments that we wouldn't have necessarily known about like premium glue, screw nails, extra water proofing measures, QuietRock, etc. When we decided not to install air conditioning, he suggested that while the walls were open we spend a few hundred dollars to put in a condenser line since it would save a lot of money down the road if we ever want to install a system. He was also good about pointing out areas where we could save by selecting less expensive options that didn't compromise quality like using MDF instead of wood for certain decorative trims, where to beef up on insulation and where not to, as well as great referrals for talented but reasonably priced specialists like our architect, carpenter, and others. This one seems like an obvious trait to look for but it's a balancing act. To me, the only thing more frustrating than someone with a big ego who always has to have his way is a yes-man who tells you everything he thinks you want to hear. What we love about Jeff is that he's a good listener who's open to feedback but is also fair and frank with his opinions. He's a low-drama kind of guy who always tries to lower stress levels and make things work for all parties. He holds subcontractors accountable but treats them with respect so people like working with Jeff, and our neighbors can't stop raving about him. Plus, he's a dog-lover, what's not to love about that? Jeff made our project his top priority and was at our site every day and often on weekends. He was usually the first person to show up in the morning and the last person to leave. It gave us great peace of mind knowing he was doing quality control and personally managing all of the work on our house. I was shocked to hear from others who had built new homes recently that their general contractors only dropped in periodically (they were equally shocked that Jeff was always at our site). Having Jeff there everyday made the project move along faster and alerted us of any issues or potential slowdowns. Because Jeff was focused on our house and is extremely detail-oriented, we breezed through all of the inspections without any major hangups. This was especially impressive because this was his first new home build in Palo Alto--a city that's notorious for its strict code requirements. The other benefit of having Jeff focused on our job and not juggling a dozen other projects is that he's been able to spend time putting the "custom" into our custom home. He figured out how to make my vision of an on-demand dog water fountain come to life and found ways of working the reclaimed redwood siding from the old house into stunning features on our new house. Despite many unconventional requests, Jeff has always found a creative solution. Our house is going to be done ahead of time and on budget...words you never hear together in construction. Jeff has always been very upfront and realistic with us about costs and timelines. He was open with us about delays and unanticipated issues but also managed the schedule well and worked long days to keep the project on track. We had some bumps along the way but mostly we cranked along with our best-case scenario planning. It looks like we're going to finish about a month earlier than expected, which is astounding to us. Jeff doesn't lowball to win business or cut corners or suggest frivolous work for more profit. From the beginning we were able to be open about our budget and work out a contract and plan to meet it. We never once worried that our incentives were misaligned or that he was overcharging us. Some general contractors use the same subs for every job but Jeff was diligent about negotiating fair pricing, researching options and getting multiple bids when it made sense. I literally cannot say enough good things about Jeff and the experiences working with him. 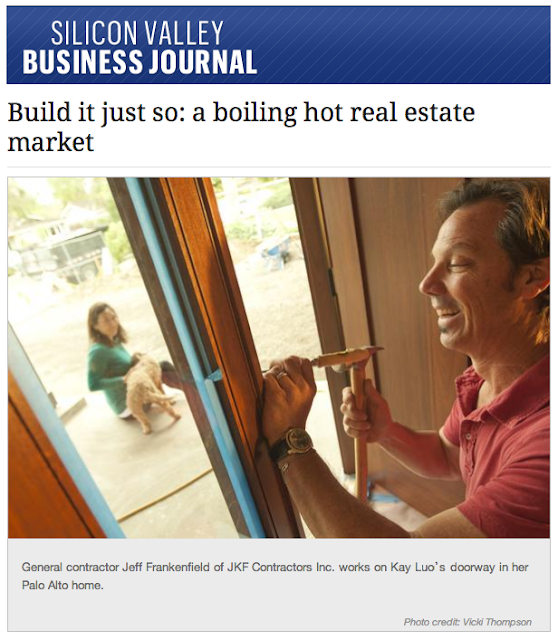 I get to look like Ms Smarty Pants with all my blog posts on how to build a new home in Palo Alto, but the truth is, the really force behind our awesome new home is Jeff Frankenfield. Jeff Frankenfield: jeff (at) jkfconstruction.com or (650)387-5680.